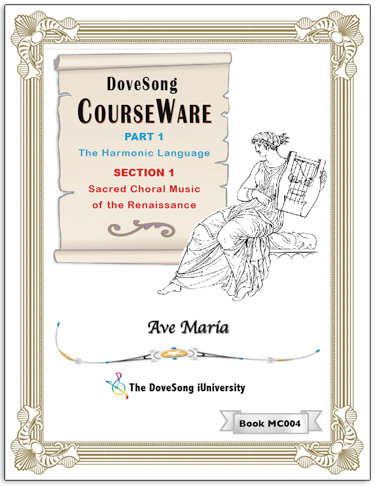 "Sacred Choral Music of the Renaissance"
The Cover for Volume MC004 "Ave Maria" An example page from MC004 "Ave Maria"
the SACRED MUSIC OF THE 16th Century is among the most important music created in Europe during any period. It is from the works of the masters of the Renaissance that we can learn to create music based on pure, harmonic concord. When I first discovered this amazing music in 1971, I set out on a personal course of discovery. Supported by the music librarian at a large state university (who told me "No one else cares about this music"), I was able to take volumes of rare music out of the library to a friend's office, where I zeroxed hundreds of pages every week. I then began transcribing this music from its archaic notation into modern "closed staff" notation, with the intention of some day re-publishing this rare music. 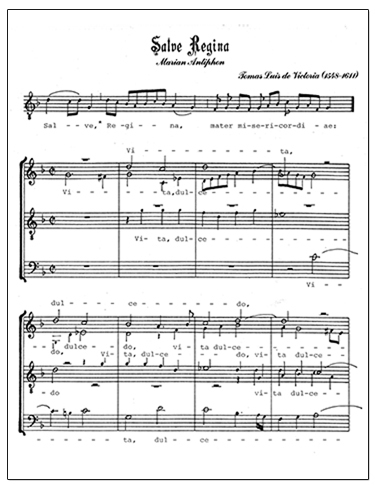 MC-006 - Sacred Music for Good Friday - Palestrina setting of Afternoon service plus Viadana, Victoria.